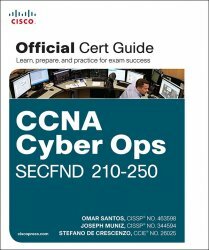 CCNA Cyber Ops SECFND 210-250 Official Cert Guide is a best-of-breed exam study guide. Cisco enterprise security experts Omar Santos, Joseph Muniz, and Stefano De Crescenzo share preparation hints and test-taking tips, helping you identify areas of weakness and improve both your conceptual knowledge and hands-on skills. Material is presented in a concise manner, focusing on increasing your understanding and retention of exam topics.